Are you bored of the default static wallpaper on your Windows 10 PC? Want to set a live 3D wallpaper as desktop background in Windows 10? Here is a free program that brings tens of free live 3D wallpapers to your Windows 10 desktop. You are likely aware that there are quite a few ways out there to customize the Windows 10 desktop background. In addition to the static pictures, you can set a screensaver or animated GIF as desktop background. 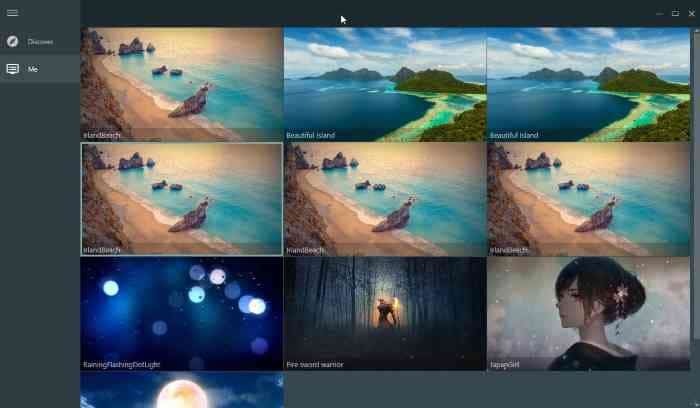 While Windows 10 doesn’t support live wallpapers out of the box, quite a few free tools out there to set a live wallpaper as Windows 10 desktop background. RainWallpaper is a free software designed to bring stunning live wallpapers to your Windows 10 desktop. In short, with RainWallpaper, you can set live 3D wallpaper as Windows 10 desktop background. The best thing about RainWallpaper is that you don’t need to search the web for live wallpapers. There is a dedicated live wallpaper gallery for RainWallpaper on DevianArt. In fact, you can download these live wallpapers from within the RainWallpaper program. Besides that, you can personalize or create your own live wallpaper with built-in wallpaper editor in this program. The program supports MP4, WebM, AVI, MOV, and WMV video formats. So, you can set your favorite video as desktop background as well (scroll down for directions). RainWallpaper supports all popular aspect ratios and resolutions and also, support multiple monitor setups, as per the developer. If you often play games on your PC, you don’t need to kill the RainWallpaper to free up resources as the program will automatically pause wallpapers while playing games. Lastly, in addition to the traditional installer, a portable version of RainWallpaper is also available. Using RainWallpaper is fairly easy, but you can follow the given below directions to get started right away. Step 1: Head over to RainWallpaper website and download the latest version of the setup file. If you wish, you can download the portable version as well. Windows SmartScreen might recommend you against running this software. To run, click More options and then click Run anyway button. Step 2: Run RainWallpaper software to automatically set one of the built-in live wallpapers as your desktop background. 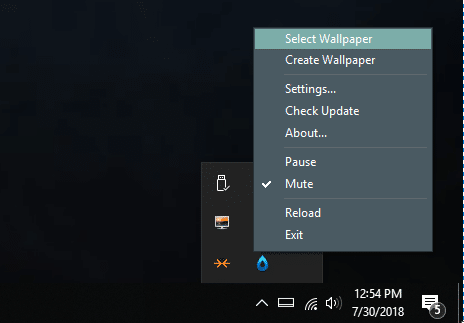 Step 3: To change the current wallpaper, right-click on the RainWallpaper icon in the system tray, click Select Wallpaper, and then choose a wallpaper. New wallpaper should appear immediately. Step 4: To download a new wallpaper, right-click on RainWallpaper icon in the system tray, click Select Wallpaper, click Discover, click one ones of the wallpapers and then click the Download button. Step 5: If you wish to set your own video as desktop background, right-click on RainWallpaper icon in system tray, click Create wallpaper option, click Create video wallpaper, select a supported video file and then click Open. Be sure to select small video files. Really nice app. I installed it on my laptop, adds a lot of personality to a windows homescreen. I also installed it to my desktop workstation, and while it does work fine, it does not scale well to a multiple large monitor environment. I have (3) 27″ screens, it’s much less pretty. If is not posible to view the desktop’s icons, then this application is not so interesting.